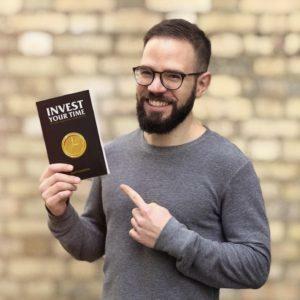 Entrepreneur coach Matt Sandrini discusses why you should invest your time instead of spending it. Matt Sandrini was stuck in a dead-end job. What seemed like a promising career turned out to be a prison-bound to spreadsheets. That was not what he wanted in life. There had to be a better way, so he invested time to learn a better way. By learning to invest your time rather than just spending it, you may see the results Matt experienced. He was finishing the same amount of work as his coworkers on any given day. The amazing thing was he was finished by 1 pm, four or more hours sooner than his coworkers. 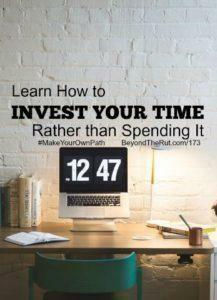 Investing in yourself is the best investment when it comes to time. What you do today will impact your future. Your present is the result of your past. What skills would you like to gain today that will change the trajectory of your future? Share this post on how to invest your time rather than wasting it. The great thing when you invest time in yourself is that you increase your margin to create time for investing time in your relationships. Life isn’t really measured by our net worth. That would be a pathetic measure of a man. The quality of the relationships we build says a lot about the type of legacy we leave. We cannot leave an impact unless we are interacting with others in our lives. What are the relationships you’d like to enrich? If you’re not up to buy the book on our recommendation, see a sample for yourself. Download your free chapter here. Learn more about how you can become a time zillionaire, and invest your time at TimeZillionaire.com. You can also follow Matt on Instagram and Twitter.